I’m writing this on the taxi ride back to ASSA from our weekend in the hill station of Munnar. This has been our 4th week on placement and we are working really hard to close loose ends. In doing this, I’ve had to deal with a side of Indian culture that I can’t wrap my head around – Indian Time. I guess Indian time is like Island time. Except we’re not on an island. Basically it’s the idea that everything happens in its own time, and people operate in a constant state of flexibility with their schedule. One of the things we have to do as part of our project is arrange individual education sessions with staff. I’ve arranged to meet this past Thursday at 11am. When 11 rolls around, I’m told he had business elsewhere and took off from the site. Really?! That afternoon I see him mulling about on the unit. Perhaps it’s cuz I don’t have that much authority on the unit, but I had to resort to getting the lead PT to arrange a meeting so that u could have a higher chance of actually running this session. On another occasion, we’re to meet an important person from the site at 5pm. One of the head honchos. Buddy decides to roll around at 5:45,gets treated like royalty. Don’t get me wrong I have him his due respect and showcased our work on the unit, but 45minutes late to a meeting you set is a tad ridiculous no? Like I said, the concept of Indian time is hard for me to grasp, especially since I’m inclined to set a schedule and follow it. Perhaps it’s because there is so much going on in Indian culture that delays are to be expected. Sort of as if this is the end result of a systemic aspect of the culture and society. Like for example, roads are not always well maintained (government issue? ), people tend not to follow tight driving rules so there are accidents (a cultural issue? ), so our cab driver comes in 30 minutes late because of what he has to put up with to pick us up. Don’t get me wrong, I’m not upset about this, this is just me trying to figure it all out. So Friday after Lunch we begin our long drive to Munnar. 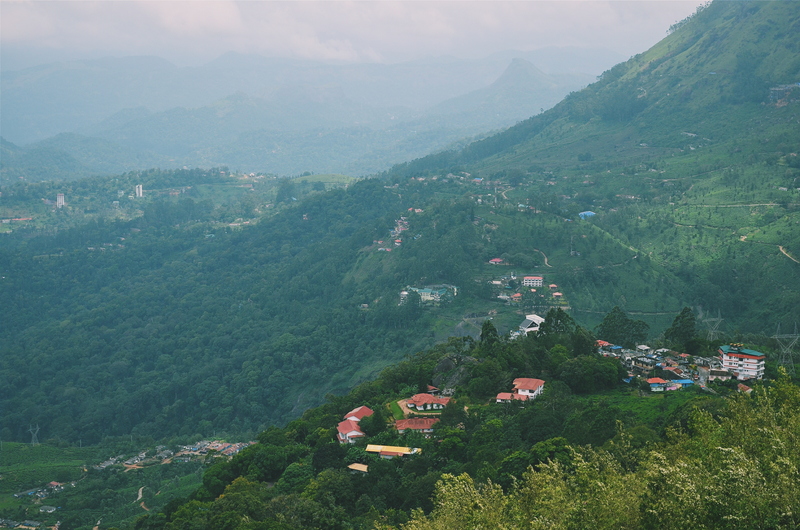 This is a hill station in Kerala, close to the Tamil Nadu border. As we start the switchback roads up the mountain, I feel cold air for the first time in a month! Dare I say, it’s even a bit chilly. What a refreshing feeling. 5 minutes from arriving at the hotel, we find a pizza shop. Honestly it tasted so good. This weekend is off to a good start. Saturday we wake up to the worst rain. Monsoon season officially begins a few days from now and the rain is sporadic throughout the day, very heavy at times. By 9, we decide that we should just do it. This is what we came to Munnar to do. 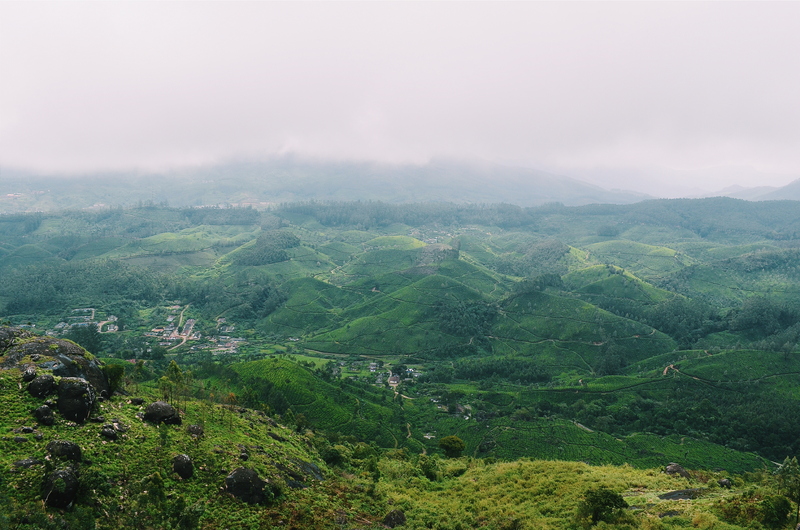 Munnar is one of the tea growing regions in Kerala, and one of the biggest in southern India. And you see this everywhere you go. The hills are carpeted with tea trees. Except they aren’t trees. 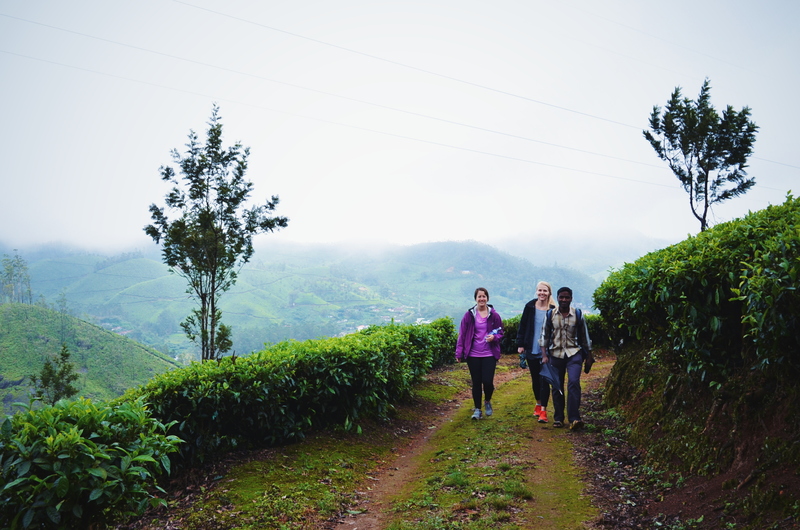 Our guide tells us that the retain their shrub size because of early pruning to yield lots of tea leaves. 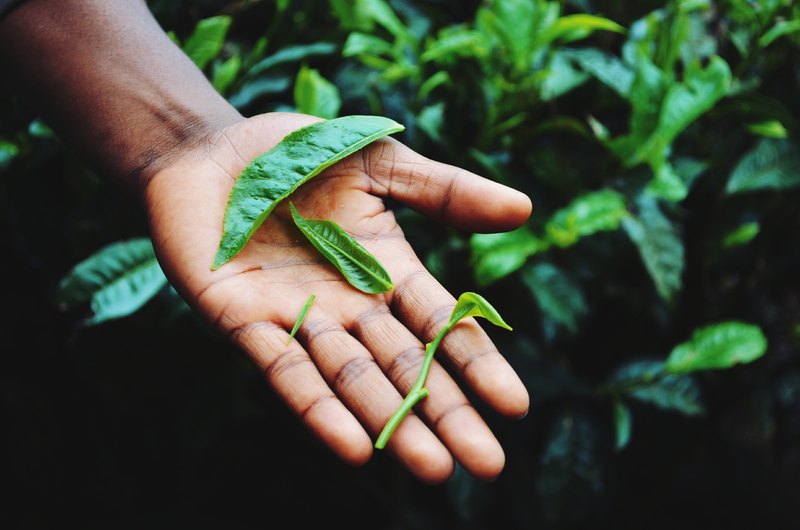 Larger leaves make black tea, medium sized leaves make green tea, and the tea tips (barely even leaves) make white tea, commanding substantially more per Kg. The stems can be powderized to make strong tea. Spotted throughout are also small cardamom and coffee plantations (more like gardens really). The view of the mountains from the top is truly out of this world. 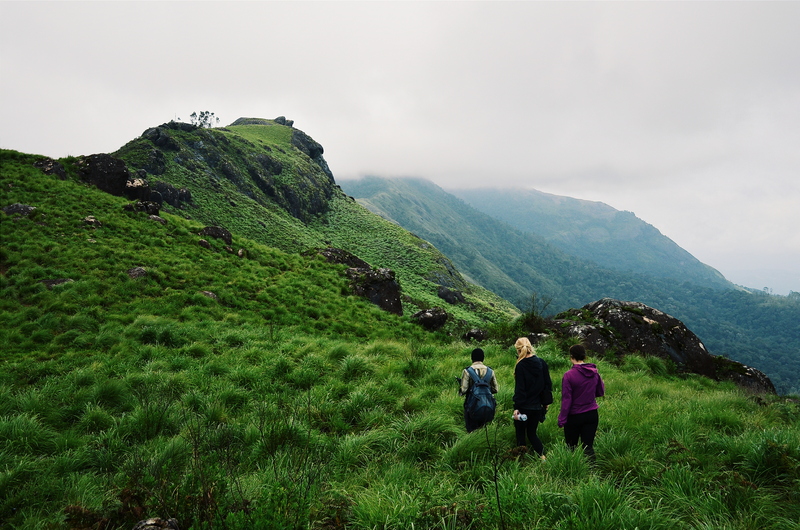 Anyone in India in need of an escape from the stifling heat, should visit Munnar for the cool temperature and spectacular views. During our breakfast I get talking with our guide. He says that his parents, like 60% of the people in Munnar, are actually from Tamil Nadu. Many people in the Trivancore region of Tamil Nadu were recruited to work the plantations by the British when they first started them in the late 1800’s. 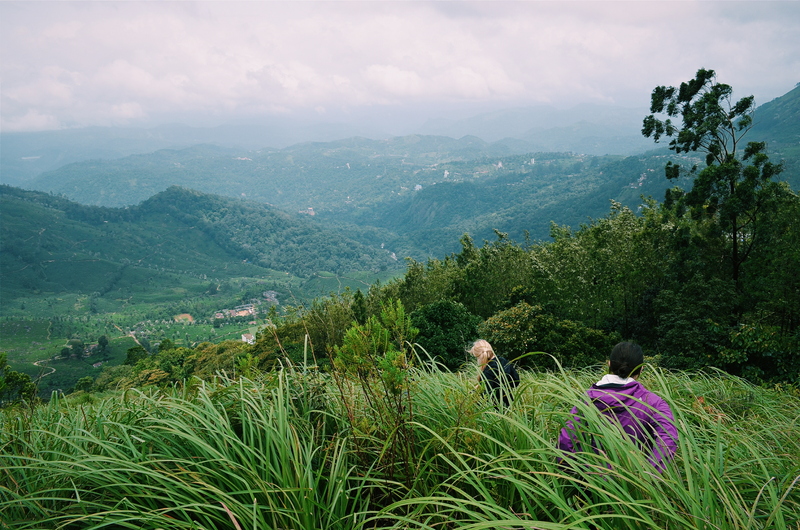 Today, Munnar remains an eclectic mix of people. In fact, in fact in Munnar town, there is a Hindu temple, Christian Church, and Mosque right within a 1.5km range of each other. No beef between the 3. That in itself is a refreshing thought in today’s world filled with religion fueled violence. I also solved the mystery of the alcohol situation in India! I asked our guide why the wine shops were always in obscure back alleys. Apparently, there is a law that wine shops can not be on main streets, and much be at least 100m from any educational and religious institution. Hence the back alley treks to fuel our cravings for beer and wine. Oh well. The whole idea of prohibition is also interesting. Kerala has taken strong action towards prohibition, closing thousands of bars with further plans to decrease the sales of alcohol. Tamil Nadu apparently isn’t far behind. It’s a heated issue, especially for those with stakes in the tourism industry. On one side, alcoholism is a major issue (we almost ran over a drunk wandering the streets in broad daylight). On the other, the government stands to lose millions in tax revenues from the sale of alcohol. One can’t help but wonder if alcoholism is merely a symptom of a more deep seeded issue. Perhaps poor work conditions? Social security? Is more education about the matter a possible solution? Kerala boasts the highest literacy rates of any Indian province, yet their job prospects are not really proportionally greater. I’m no expert, but if one wants booze, they’re Gunna get it somehow. Just my thought. Onto the last week of placement. It’ll truly be sad to leave our little gang here. One more week to do good work and prepare them the best we can to take care of themselves for the rest of their lives with their new bodies. Welcome. We Indians are as exasperated by the order of things sometimes, it is a wonder that a tiny thread of order binds all the madness together. But it takes years to get it. BTW, I landed here while searching for Munnar. Hope you had a good trip ! Haha I always think there is order in the chaos. Regardless I still had an awesome time in India. Hope your travels are going well!